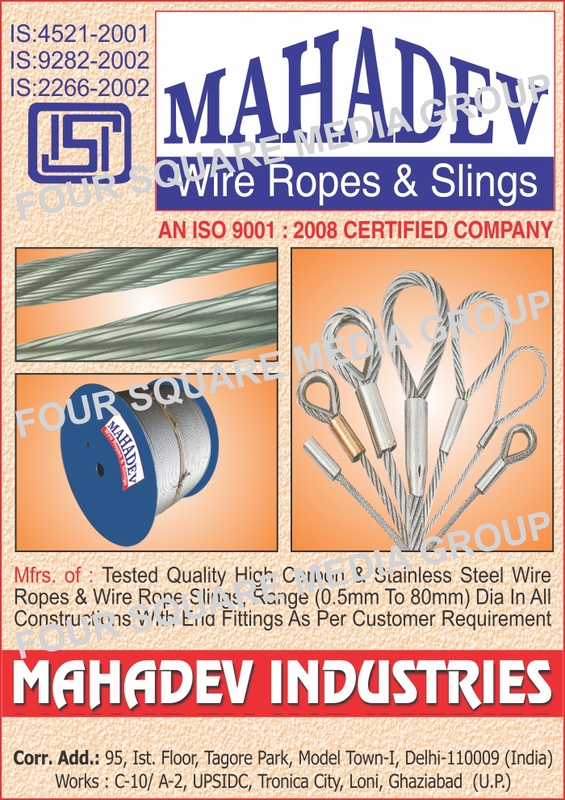 Stainless Steel Wire Ropes, Carbon Steel Wire Ropes, Carbon Steel Wire Rope Slings, Slings, Wire Ropes, Steel Wire Rope, Shipping Rope, General Engineering Ropes, Oil Well Drilling Ropes, Suspension Bridges Ropes as an active Manufacturer, Supplier, Dealer, Distributor, Trader and Seller etc. (*Importer/Exporter/Service Provider). Mahadev Industries has in house production plant with in-house testing facilities to ensure that everything is up to the mark of specified standards. This self-assurance comes from the strong infra structural and technological capabilities. It has state of art machineries and fully equipped testing labs for continuous process testing from raw material to finished goods according to National and International Standards and for this we can say rather we are proud of having breaking load capacity of 300 M.T. with crimping machine (for slings) up to 2000 M.T., and to complement it further there is an in-house test laboratory having a full range of facilities for chemical analysis and mechanical testing of wire, wire ropes and other allied articles/accessories. Highly skilled workforce reflects Mahadev’s commitments to continuously serve its customers and to produce high performance and cost effective.